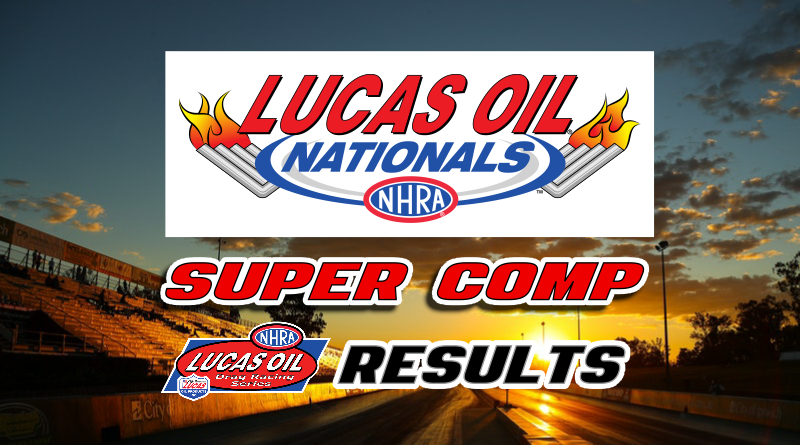 BRAINERD, Minn. – The Super Comp final at the NHRA Lucas Oil Nationals produced another first-time national event winner as Don Nichols, of Lincoln, Neb., captured the Wally in his second final round appearance of 2018. Nichols, the runner-up at Topeka earlier this summer, drove his ’07 Don Davis dragster to the winner’s circle after defeating first-time national event finalist Donald Leisdon of Rosemount, Minn. Nichols’s win came over a tough field of 61 competitors from all over the U.S.
Nichols earned his first win by pairing great reactions – .013 R.T. average in eliminations – with a consistent car that ran close to the 8.90 index in each round. Nichols had three .00 reactions through six rounds and ran within .002 of the index on three different occasions including a dead-on 8.900 in his fourth round win. Nichols run to the winner’s circle began with a double-breakout win over Kenneth Moses in round one. Nichols was near perfect as he left with a .001 light and paired it with a 8.898 E.T. to take the win. Moses was .035 at the tree and 8.866 to end up .002 behind at the finish in the losing effort. Nichols benefitted from his competitor’s red-light starts in the second and third rounds. Don Higgins, of Crew Chief Pro fame, turned it -.002 red in the second round and Daren Erickson was -.020 red in the third round. Nichols was sharp at the tree in both rounds as he left with a .012 light in round two and an .011 in round three to move into the fourth round. Nichols laid down .012 total in his fourth round matchup with top ten ranked Austin McClure who trailed Nichols with a .029 package. Nichols laid down another strong .012 reaction to beat McClure’s .021 off the line. With both driver’s setup on an 8.89, Nichols reaction time advantage gave him just enough room to whack the throttle at the top end to take .017 stripe and go 8.900 for the win. McClure also ran dead on the index but his 8.908 came up about four feet short at the finish line. Nichols tightened up the stripe just enough to avoid a breakout. The semifinal round proved to be a lucky round for Nichols as he posted his worst reaction time of the event .035 and missed the setup as his dragster could only produce an 8.943 E.T. Luckily, Nichols’s opponent Jordan Pratt, who had been holding as much as .05 in earlier rounds, decided to give up the stripe allowing Nichols to take the win. After Nichols took a small starting line advantage, .035 to .044, Pratt took control of the race down track as he looked to be on an 8.87 lap. As the racer’s neared the stripe, Pratt dumped hard to go 8.950, giving up the stripe by .016 and allowing Nichols to take the win and move into his second final round of the year. Runner-up Leisdon had an interesting path to the final round. Leisdon and his ’97 Spitzer dragster made three 8.90 laps during eliminations but also had two .7 reaction times. Leisdon was typically holding about .03 to .04 on his 8.90 index with the exception of rounds two and three. The first two rounds proved fortune was on Leisdon’s side as he took a chunk of stripe, .056 to be exact, against first round opponent Murray Hebert to go 8.900 and in the second round when opponent Samantha Coughlin turned it red by -.001 as Leisdon missed the tree with a .075 reaction. After a third round bye, Leisdon matched up against Division 4 ace Craig Anderson. After both racers left with .03 reactions, the race got real interesting at the top end. With both racers setup around an 8.87, both braked hard at the stripe to go dead-on the index. Anderson killed 16 mph to run an 8.908 while Leisdon was just slightly better as he dropped to an 8.904 in taking .008 at the stripe to take the two foot win. This was the second time during eliminations that Leisdon dropped at the finish line to go dead-on 8.90. Waiting for Leisdon in the semifinal round was none other than two-time Super Comp national champion Gary Stinnett. Stinnett had been brilliant in the earlier rounds combing killer lights with an ultra-consistent racecar. Leisdon took his best shot at Stinnett and came out on top when his .014 package, his best of eliminations, easily defeated Stinnett’s .057 package. Stinnett trailed out of the gate, .029 reaction to Leisdon’s .003, and wasn’t holding enough E.T. to push Leisdon under at the finish line. Leisdon once again dropped from his 8.86 setup to an 8.911 E.T. to move into his first final round. Leisdon picked a great time to post his best package of the race. In the final round, Nichols was near perfect at both ends of the track for the second time while Leisdon made his worst run of eliminations. Nichols posted a .004 reaction while Leisdon was .071, his second .07 reaction of the race. Although he killed about .03, Nichols took a big chunk at the finish line (.045) to post an 8.899. Luckily for Nichols, Leisdon followed him through the finish posting an all-out 8.877 handing the double-breakout win to Nichols. Nichols did a great job throughout the race to capture the well-earned Super Comp Wally. With this win combined with his runner-up at the Topeka national in May and his LODRS win at Tulsa, Nichols finds himself ranked just outside of the top 10 in the national standings. With two complete races left to claim, Nichols has a great shot to be a contender for the national championship later this year. Congratulations Don on your first national event win! NHRA Championship Drama At D5 and D2 LODRS?